Nestled in a pretty bay on the southeast coast of Spain, the small Spanish resort town of Moraira is an oasis of traditional charm on the busy Costa Blanca, a favoured holiday spot and retirement haven. Moraira has grown from a small fishing village into an attractive resort surrounded by luxury villas without losing its Spanish character, which is entrenched in its impressive marina, variety of shops, colourful weekly markets, atmospheric old town, and waterfront restaurants and bars. The relaxed traditional ambience of Moraira is complemented by two main beaches with European Blue Flag status, separated by a promontory crowned with a medieval fortress. There are also plenty of sport and leisure facilities on offer. When it comes to holiday weather in Moraira, it is one of the best Spanish beach resorts claiming an average 325 days of sunshine a year, and temperatures that stay constantly pleasantly warm. Fresh sea breezes ensure that it is never sweltering in summer, and the surrounding mountains protect the town from the chilly winter winds. This beach resort is easily accessible, being equidistant (about 62 miles/100km) by motorway from both Alicante and Valencia airports. For those who enjoy a taste of the high life, it is also within easy reach by car or bus of the busier, glitzier Costa Blanca resorts of Javea, Calpe and party-mad Benidorm. The countryside around the holiday destination of Moraira offers some lovely scenery dotted with unspoilt villages to explore. There are no large supermarkets and shopping malls within the confines of the holiday resort of Moraira itself, but these can be found not far away in the approaches to the town and surrounding suburbs. In the main avenues of old Moraira, shoppers are well catered for with all manner of boutique stores selling local arts and crafts, souvenirs, holiday gear and bric-a-brac. The most fun to be had shopping, though, is at the Friday weekly market where the wares range from fresh fruit to leather goods, pottery and rugs. Good buys include wicker furniture, handbags and wrought iron objects. Serious shoppers can make expeditions to the larger resorts and towns nearby. The street market in Teulada, a few miles inland, is worth a visit. Despite being relatively small, central Moraira is equipped with numerous good quality restaurants, several of them Michelin starred, offering great value for money. Being a fishing community with an active fishing fleet that brings home a catch each day it follows that fresh seafood forms the base of the local cuisine, and many of Moraira's restaurants offer this in delicious abundance. For a budget meal look out for the menu del dia (menu of the day) offered by many restaurants, usually consisting of different courses with wine and coffee for a set price. 'Workman's specials' also feature on some menus, offering good value. Most Spanish bars serve tapas selections during the day, good for a satisfying local snack meal. Those with diverse tastes will find a variety of international cuisines among the local establishments, from English fish and chips to Greek delights, and Indian curry to pizza. The nightlife of Moraira is considered sedate compared to some of the larger and flashier Spanish resorts, but the town buzzes happily after dark. Many of the restaurants offer live entertainment of some description, including flamenco dancing and karaoke, and there are one or two open-air dance venues. The main club for youngsters is the Costa Sur, just outside of town, which offers a range of entertaining evenings with foam parties, striptease and the like. Other Moraira nightlife options include Saxo Disco and the music pumping Algas Beach Bar. Those who holiday in Moraira during the months of April, June, July and November will catch lively fiestas full of local colour and tradition. Calatalud Drive in the old town is generally closed off during summer and fiesta nights. 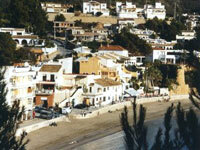 Moraira's lovely beaches offer plenty of fun in the sun, with a wealth of water sports available. Local leisure facilities include golf courses and other sports like tennis and squash. Several day excursions are on offer to places of interest, like the mountain-top fortress of Guadalest, Europe's largest palm forest, and the nearby ancient city of Murcia. Families enjoy the Moraira go-kart track, or an outing to the Aqualandia water park near the large resort of Benidorm. There are no huge nightclubs or discos in Moraira and the clubbing scene is fairly low key when compared with other Spanish beach resorts in the Costa Blanca region.